Fridays on FUV, Take Five with The Alternate Side. This week: The Walkmen. The Walkmen must be feeling pretty upbeat given the wildly enthusiastic response to the band's seventh album Heaven, a record which also parallels the quintet's tenth anniversary. 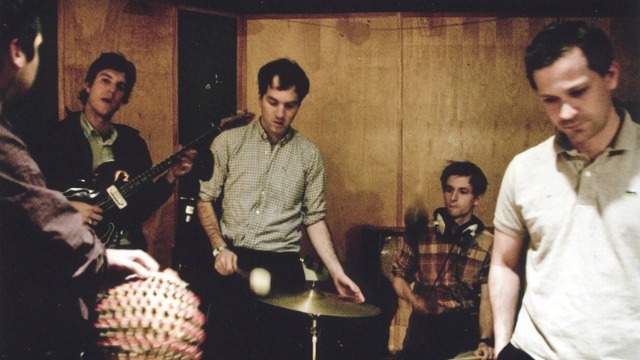 It has also been the best of times for The Walkmen personally; all of the guys — singer Hamilton Leithuaser, guitarist Paul Maroon, bassist/keyboardist Walter Martin, organist Peter Bauer, drummer Matthew Barrick and are married with children and that tender, domestic viewpoint is quietly reflected in Heaven's gentler temperament. The Walkmen, on tour now and returning to New York to play Terminal 5 on October 18, visited The Alternate Side earlier this spring for a live session. Between selections from Heaven, the guys talked with host Eric Holland about an array of subjects, from the horrible sound of an arm breaking (Paul's arm, to be exact) to working with Phil Ek—the first time The Walkmen have fully worked with an outside producer. Check out the session today 11 a.m. EDT on 91.5 WNYE and online, and check out more in-studio videos at The Alternate Side.